Planning a bachelorette party? Birthday? Farewell? 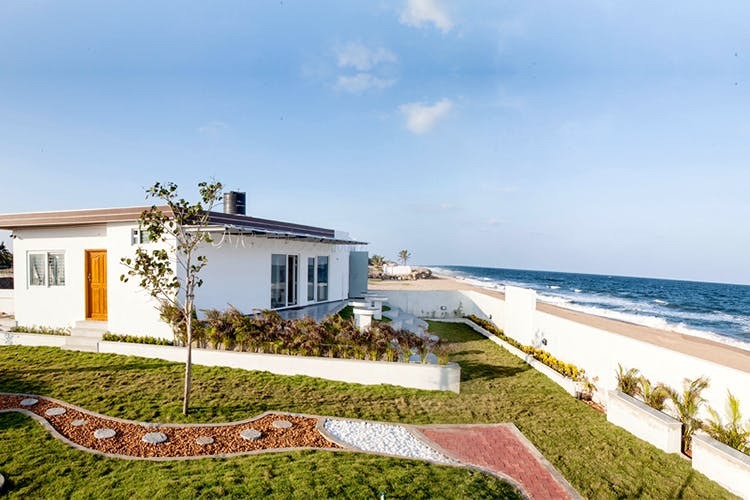 We found a lovely beach side villa on ECR for any occasion. B's Hive - Kadal is a serene villa bang opposite the beach on ECR and what we love most here are the facilities on offer. The white villa is one of a kind with an A/C dorm than can accommodate more than 10 people. Their outdoor verandah is vast and filled with cane seating and plenty of hammocks! We just spent all day lying down on the hammocks, overlooking the sea and star gazing at nights. Warning: there are no TVs or too many modern facilities at this crib. So, spend time outdoors maybe?You could also request for tents by the lawns, if you want a mini camping setup adding to the beach house vibes. Also another thing about the villa that got us all excited is their Jacuzzi and open showers. Perfect if you just want to unwind!